In His earliest days (even upto 1890), Sai Baba had youthful love of art and music. Dance and music has been used as a powerful means to be one with divine by various Spiritual Masters. Sufi masters have been known to use music and dance as an aid to merge with the divine. The devotional songs sung by Sufi dervishes are called Qawwali. Chaitanya Mahabrabhu and Nityananda were used the singing and dancing in love of God. Shri Ramakrishna Paramahamsha also used to sing devotional songs and dance in divine frevor and created great spiritual force to drive many to spiritual interest and divine drunkness. It is also known as Bhakti movement. The way of singing and dancing to the God. Shri Sai Baba often use to go to a place called Takia, the resting place for visiting muslims and sing devotional song with sweet and melodious tone. 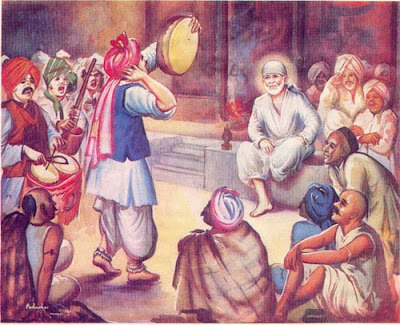 Sai Baba mostly sung the divine songs of Kabir. Sai Baba also sung song in Persian or Arabic, which the local people did not understood. Sai Baba also use to tie tinklets (Gungroo) to His feet and danced in divine ectasy singing the devotional songs and bhajans. Devotees with the knowledge of singing and music were sometimes explained the ragas or musical notes in detail by Sai Baba. Sai Baba also encouraged and loved the singing of Bhajans Devotioanal songs in Dwaarkamaai when too many devotees started visiting Shirdi attracted by the divine magnectic and loving and caring force of Sai Baba. You may also like to Visit blog devoted to Bhajans and devotional songs devoted to Shri Sai Baba of Shirdi.